Our day began with some nice Italian coffee and some cheese education. Some very simple information was given to help us get into the cheese mindset. Neil and I love cheese but we had never really learned about it so this was extremely helpful. First some cheese vocabulary, there are only 3 ingredients in cheese: milk, salt and rennet. What is rennet you ask? Great question, it’s an enzyme in an animal’s stomach that coagulates milk. Now there are also vegetable rennets created by lemons or an Italian flower, for those who only eat vegetarian. Casein is the protein found in milk. Did you know that cheese is made from the milk of many animals? There are cheeses made from goat, cow, sheep, buffalo and donkey. Pretty interesting! Another thing we were very surprised to find out is that there are over 4000 known cheeses in the world. We had no idea. Well let’s move into the cave so we can start seeing some of these cheeses! 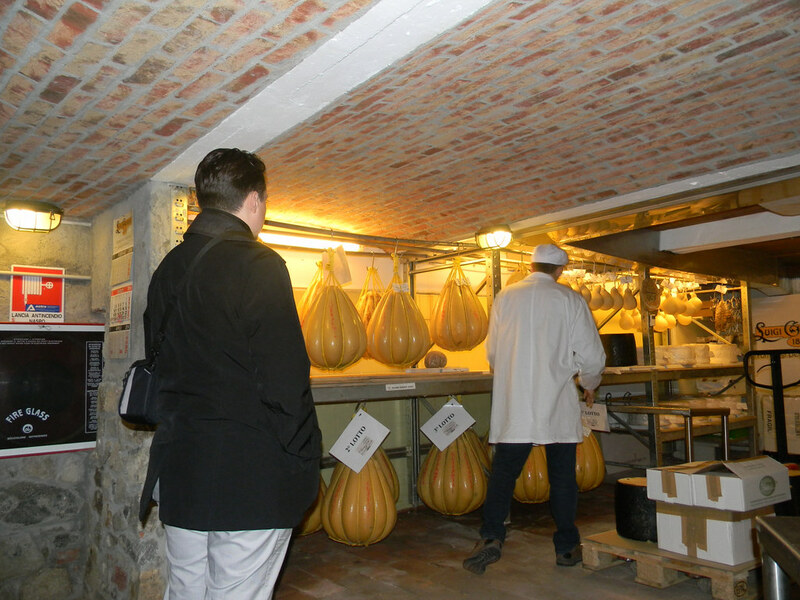 This facility was originally used to store ham until Luigi Guffanti (http://www.guffantiformaggi.com/en/) moved in and started storing cheese there. They have been in business since 1876 but have had a couple caves along the way. Their former cave could no longer be used due to some new federal regulations back in the 1970s. When they moved into this location they were able to bring some of the old beams and other materials to keep some of the tradition alive. Speaking of alive, did you know that cheese is alive? That’s why so much care is required when cheese is being aged and stored. The first cheese we saw was the original cheese discovery, a goat stomach peeled open with “cheese” inside. Some would find this gross but it was pretty exciting to see. There were somewhere between 250-270 different cheeses being stored in this cave so we will mention a few that have interesting processes or stories. Provolone is stored by hanging it in a large bag. It must be turned regularly to keep its shape. Pecorino Romano has a black rind made of ash and wax. 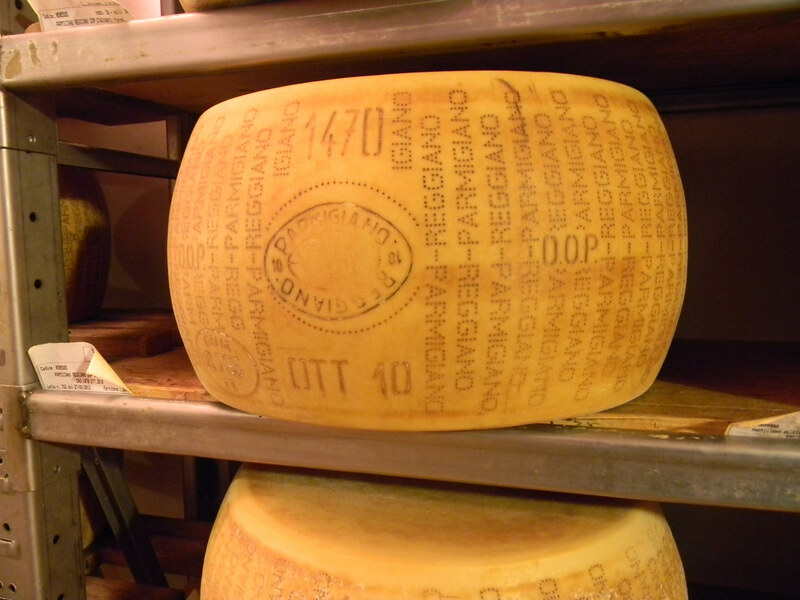 Parmesano Reggiano has the month and year of production stamped on it, and can only be divided into 4 sections in the production area in order to properly show this stamp. Caciovallo die basilischi used to be hung on horses like saddlebags for transport. The education continued as we toured the cave. We learned how there are many similarities between wine and cheese. 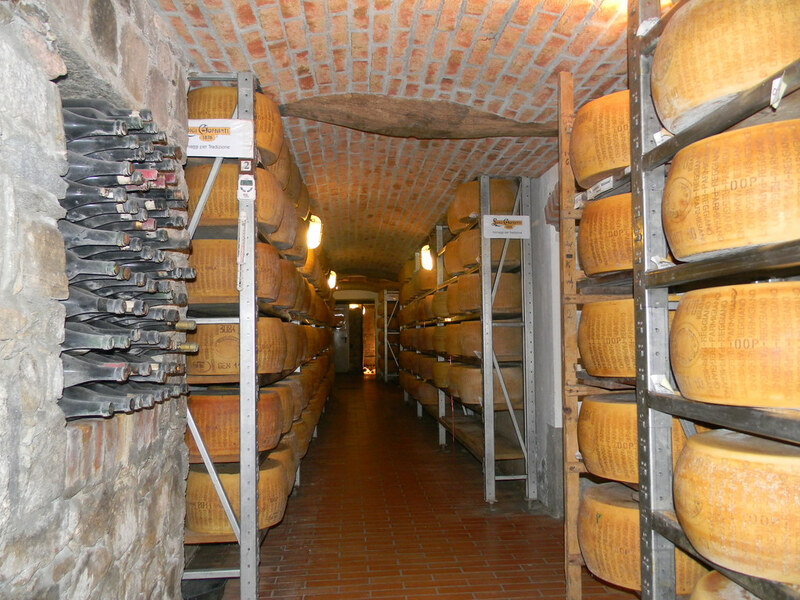 Certain cheeses must come from specific regions and are certified DOP like the DOCG for wines such as Chianti. 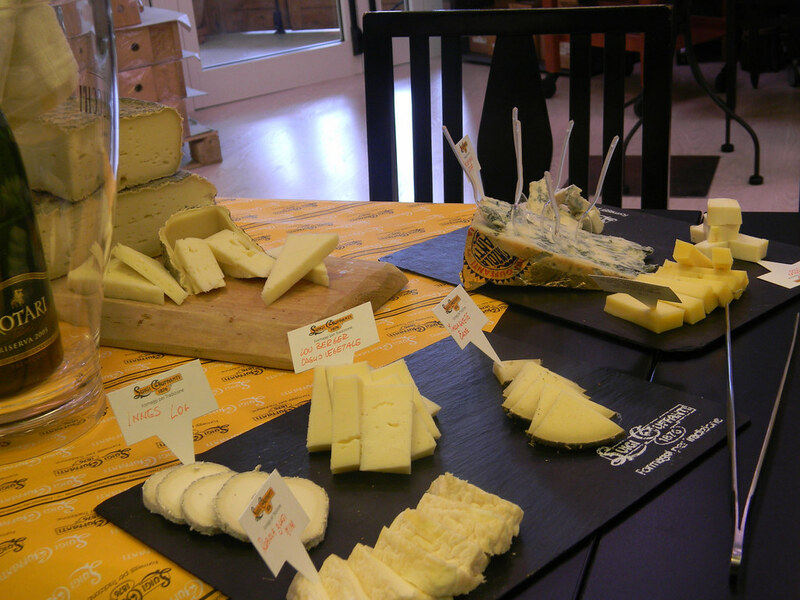 Cheeses are also named for those regions such as Gorgonzola which is a town near Milan. Cheese is aged, which we saw a lot of this tour, but different cheeses are aged different amounts of time and when they are aged longer they are sometimes called “reserve”. Some of the storage specifics. The cave has a natural humidity due to the river on the other side of the wall. Also the temperature is monitored and is usually kept around 12 degrees Celsius. 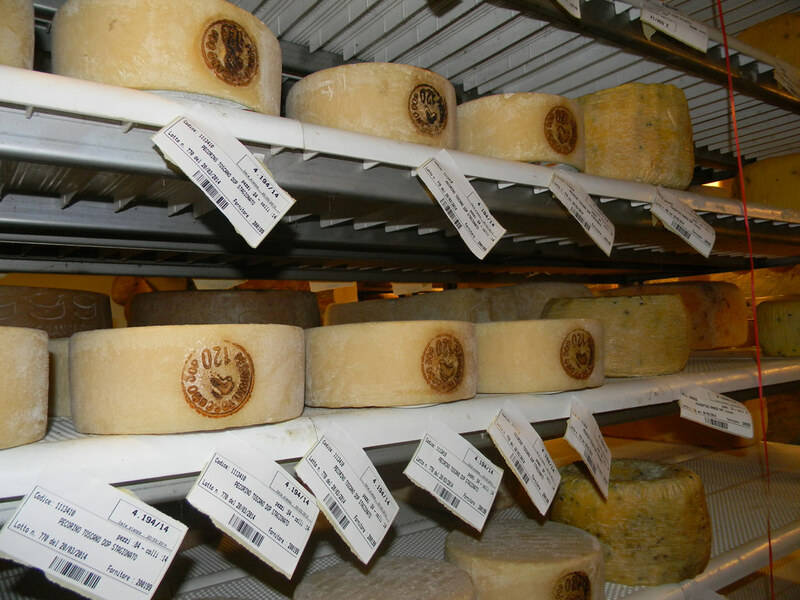 Some cheeses are stored on plastic shelves and others on wood, but all are labeled with lot, batch number and supplier for tracking purposes. Also different cheeses need to be separated so the flavors do not cross contaminate. So at home do not put your blue cheese and cheddar together or they may combine. No, seriously. 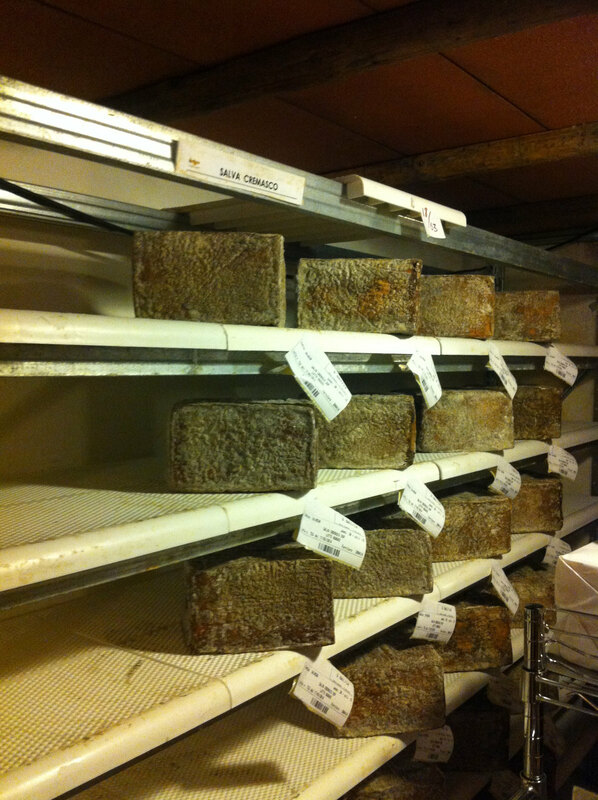 Cheese needs to be handled regularly during the aging process, touching it helps decide how the aging is going. 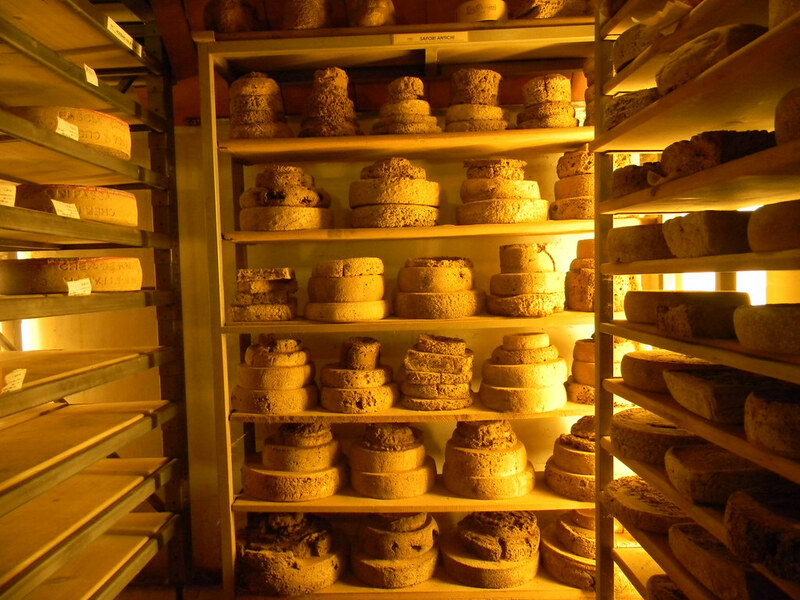 Mold regularly grows on the cheese so they need to be washed and scrubbed by hand with a brush and cloth, some daily, weekly or monthly depending on the cheese. We were able to see the cheeses being cleaned while we were there. 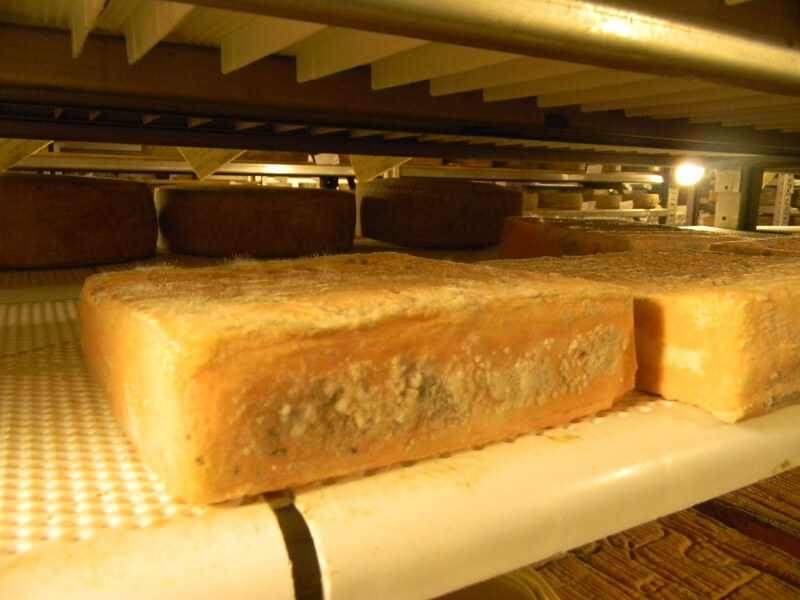 There were other cheeses aged in a refrigerated cooler, around 4 degrees Celsius, and the washing occurs in the cooler. 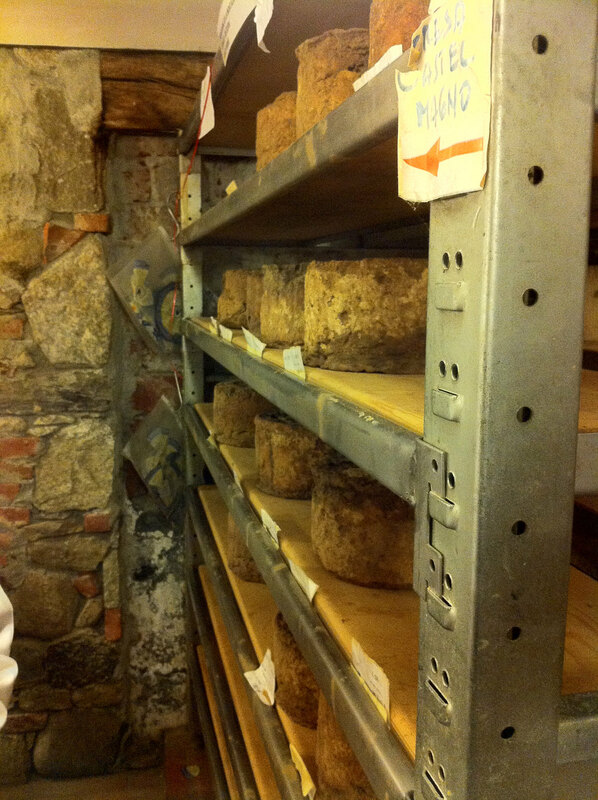 More cheese stories…In a back corner they have the Sapori Antichi, “old cheese” from the 1990s that is being monitored for quality and is still edible. Hard to believe it’s still okay, it looked pretty ugly. Salva Cremasco was a square cheese that was created in order to extend the life of the milk, instead of it spoiling, it was turned to cheese. Sola is a thin, flat cheese that resembles a shoe sole after the moisture escapes due to the aging process. Castel Magno is a cheese that looks like cake with some blue inside, from this region (Piedmont) and is used in upscale restaurants. Not many people have heard of or seen this cheese. 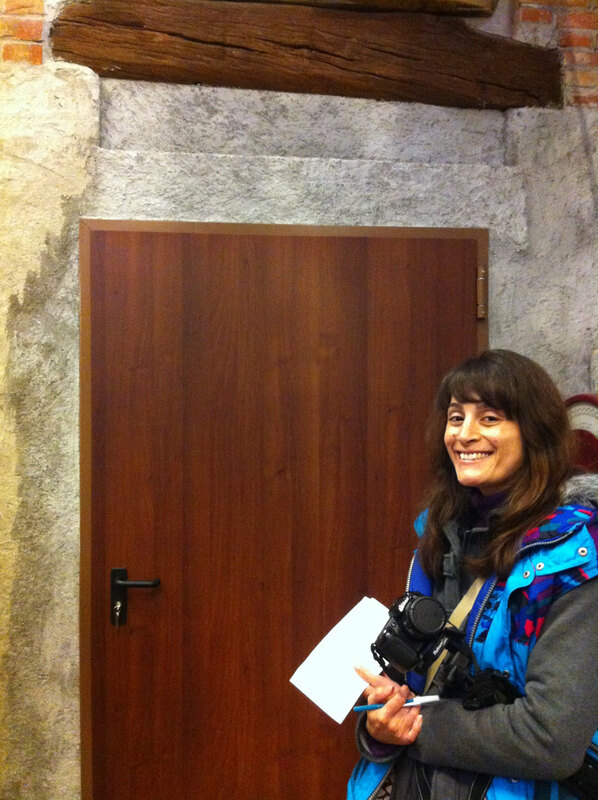 Although we didn’t get to learn much about the cheese making process we did see a few photos. The cheese making process is deeply rooted in tradition, some being made by hand in tents on the mountain tops and then carried away by donkeys. These are classified as Alpage cheeses, coming from the Alps, and produced at altitudes over 2000 meters high. Amazing that these cheeses are made that way and not by machines. Luigi Guffanti looks for specific conditions when seeking out a new cheese, such as raw milks, free range animals and proper tools to create the cheese. By the end of the tour, our minds were overflowing with information and our senses kind of overloaded from all the cheese but what an incredible experience! We even ended the day with an amazing lunch with cheese, mounds of salumi, sparkling white wine, breads, and dessert. We could have never imagined this would all happen during a tour, never mind the kind hospitality from Davide and his crew. Thanks so much to Luigi Guffanti for the tour, education and wonderful lunch!